WaldaBlog: More Photographic Evidence Uncovered! 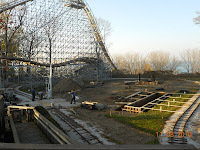 In an astonishing find, more photographic evidence was uncovered that confirms the suspicions of Waldameer's 2011 expansion titled the North End. At first there were skeptics, doubting the previous construction photos calling them "grainy" or "a clever use of photo shop". It seemed there would never be a clear answer whether the rumors of this wonderful expansion were true. Until now. 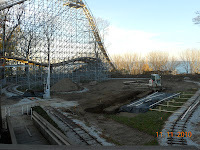 The following pictures of the brand new rides as well as more construction photos help put any doubts to rest. As you can see, these new rides are as colorful as anyone could imagine, creating awesome displays of light, color and motion that seem to tickle your eyes. And, since all pictures can say at least 1000 words, these pictures seem to say words like "fun", "graceful", "laughter" and "excitement". So stay excited and keep checking back often. Word is there is more to come. As for now, case closed? Also, visit http://yourerie.com/search-fulltext?nxd_id=145767 to see the news article in the Erie Times along with video interviews.